What are your thoughts on prepping? Thread: What are your thoughts on prepping? By prepping I mean stuff like this: doomsday prepping. I had a paragraph about biological warfare agents but instead I'll just leave a link: biowarfare. So do you prep? Do you think preppers are crazy? Just seems like they have got the risk/effort ratio calculated wrongly. But, I suspect for most of them prepping is actually a fun hobby, so the actual risk doesn't even matter that much. I'm with Dirac, seems recreational. The advantage of doomsday prepping is that while the thing being prepped for is both unlikely and likely beyond a person's ability to prep for, the preparations cover a wide array of significantly more likely disasters. Therefore, I think it can be an entertaining and useful exercise. The unlikely and unknowable nature of the imagined threat can add a certain gameification/fantasy angle that keeps motivation high, whereas focusing on the more real near term potential disasters could sap motivation and be depressing. Though it all comes down to how you approach it. You generally only hear about people who are fanatical and crazy grade serious. You rarely hear about someone who built a bomb shelter in their back yard to play in. Though I don't doubt there are many. I can see it being a recreational thing when people really get into stocking up on everything and learning how to reload their own cartridges and building shelters and stuff like that. But then there's stuff like making sure you have fire extinguishers and emergency food and drinking water around, stuff that it's recommended for everyone to do but it seems like hardly anyone does. Most people don't do a risk analysis at all I think, and accept risks that, while they might be relatively unlikely to happen, would have dire consequences if they did and would require relatively little effort to mitigate through preparation. The page you linked to is kinda silly imo because they equate the "just enough" prepping to not really being prepared for anything at all, but that sort of makes sense since they're trying to sell stuff. 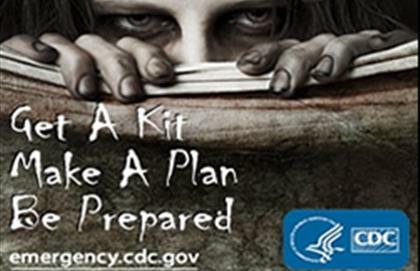 The CDC tried to take advantage of that mentality with a campaign urging people to be prepared for a zombie apocalypse. Of course what they really meant was to be prepared for the types of disasters that are likely to actually happen, but the zombie thing makes it fun I guess. Good point; it is pretty cool to have a NBC mask just lying in my closet (not a full blown "prepper"; just have a few select accouterments). Ha, so kinda like LARPing, but with a purpose? Most people don't do a risk analysis at all I think, and accept risks that, while they might be relatively unlikely to happen, would have dire consequences if they did and would require relatively little effort to mitigate through preparation. I do this for most things as well, like driving for instance; although I do have a much higher risk tolerance than most people. I think preparing for disasters just brings more disaster into your life. If you keep thinking about it, it is there, and it exists. The worst part of having to go through a disaster is probably the bad feelings you feel while it happens. So if you keep thinking about it, you're bringing those feelings into your life. Unless you take it lightly, of course. But in most cases, people that prepare for bad things are constantly trying to protect themselves from imminent attacks and that whole atmosphere of fear is very heavy and unhealthy. I'd rather expect good things to happen. I'd rather prepare myself to deal with any sort of situation imaginable than stockpile a ton of heavy, cumbersome (however useful) goods. Some level of prepping is reasonable, but I would rather rely on inventive problem solving than hoarding in general. But they're on the fringe for a reason, if everyone did as they did, it'd probably cause doomsday. It seems foolish to not be prepared for earthquakes when you live in an earthquake-prone area. Same for hurricanes, tornadoes, etc.